I finally replaced my ten-year old car a few months ago, and have been happily learning about all of the new technology in modern cars. It’s like a candy store, especially compared to my old vehicle which was limited to power locks and a car alarm. One feature that I was surprised to learn about was voice to text. When a text message comes in, the car will connect to my phone and will ask permission to read it. The voice recognition software will pick up my command (yes or no), and the pronunciation, even for uncommon words in text messages, is remarkable. Then, it will extraordinarily ask me if I want to reply. I speak, and it will create a responding text message. This is also amazingly accurate. Two things: first, this will make things a little more complicated for attorneys who are litigating distracted driving lawsuits. In Maryland, as you know, it is against the law (not to mention unsafe) for drivers to use handheld phones while driving. That means no e-mailing, no texting, and no holding the phone up to your ear. The exception is the hands-free option–right now, we are allowed to use the phone as long as it is through some sort of hands-free technology, like bluetooth. One common source of discovery in accident cases is for the negligent driver’s cell phone data–was the driver receiving or sending texts at the time of the accident? If so, that is important evidence to show distracted driving. Now, however, lawyers must find out if the negligent driver’s vehicle has these voice-to-text features, because those are within the boundaries of the law. The second part of this, though is that the claim could be made that it is unsafe to use those features. One study (here’s the Mashable cliffs notes, and here’s the study) has found that there is no appreciable difference between manual texting (using the phone and typing out a message) and using a voice-to-text software like Siri. It sounds counter-intuitive, but it appears that the same degree of concentration is involved whether a driver is looking at the phone or not, and it yields the same amount of distraction. Research like this hasn’t really penetrated the consumer consciousness, but as it is developed it is likely that it will be recognized by the public and legislators. 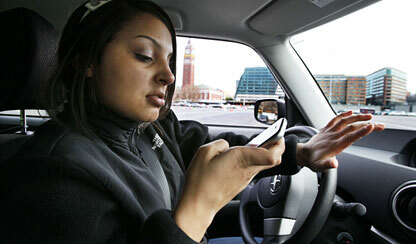 There are bound to be some states which will proscribe the use of a phone, even hands-free use, while driving. In a lawsuit, the standard of care is what a reasonable driver under similar circumstances would do. Could there be a day when a reasonable driver would not use hands-free? For more information about distracted driving, or if you were hurt in an automobile accident, contact us at 443.850.4426 or online.